Good morning everyone! Looking for a last minute easy gift idea? Look no further! 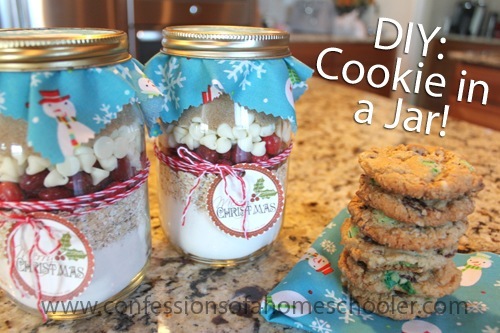 Today I have this adorable Holiday Cookie in a Jar recipe to share with you! These are not only super cute, but they’re also delicious! So read on to see how we made these lovely gifts for our friends and neighbors. 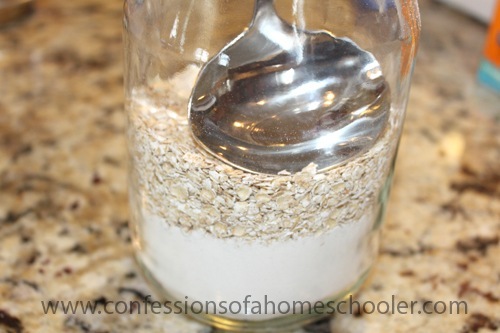 I have to admit, I’ve seen this idea all over the place, but I’ve never made them myself! So I thought now would be a great time, and I have to say, these are seriously quick to put together, so if you’ve waited until the last minute and need something quick, but still awesome, this is for you! Of course we had to make a batch just to make sure they turned out good. Also so we could get pictures and all. I know, it’s a rough job, but someone had to do it. 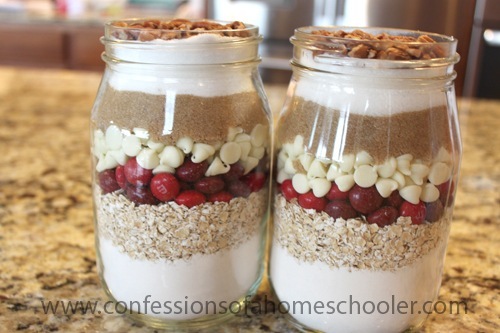 Layer ingredients as directed below in your jar. As you add each layer, use a ladle or spoon to pack the layers down tightly. I mean it, pack them well, or it won’t fit! Plus if you pack them tightly the layers will hold their form much better and look all nice and pretty in your jar. 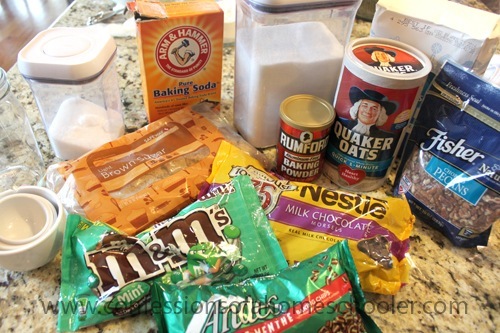 Layer 1: flour, baking powder, baking soda, salt. Next decorate your jar! I added some festive fabric to the top of mine. Then found some holiday string and tied these cute labels onto each jar. They each have two tags tied on them, the first one is just for pretty, and the second tag has the baking instructions. 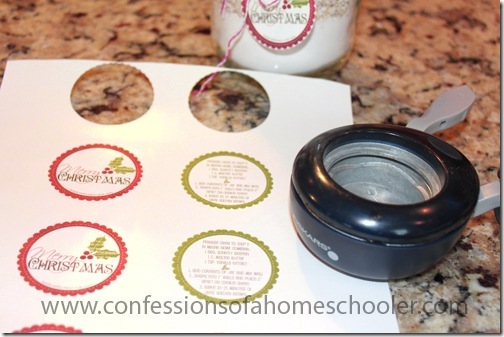 I used a 2” circle punch to punch out the tags, then a small hole punch to cut a hole for the string. The picture below uses red and white baking twine that I found at my local craft store. You can download my Christmas cookie labels here! And that’s it! 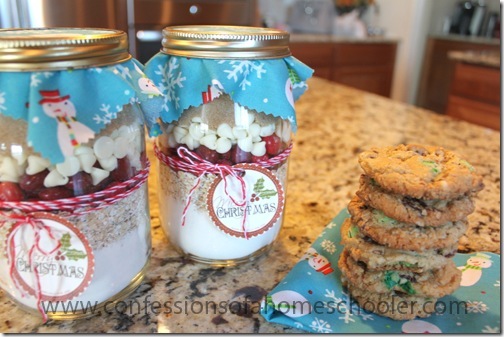 These make lovely Christmas gifts, and they were really yummy too! 3. 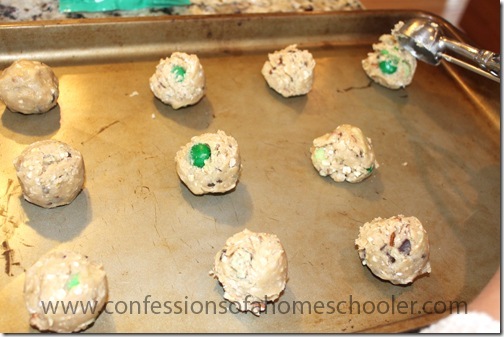 Mix everything well, then shape into 1” balls and place 2” apart on a cookie sheet. Bake 10-15 minutes or until golden! You have no idea how many people I had to fen off to get this picture! 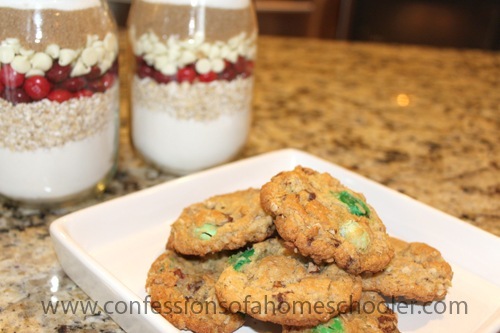 We also found some Andes mint chips and made a batch of mint-chocolate chip cookies. Yum! I hope you enjoy this last minute gift idea! Have a great last minute gift to share? Send me a tweet or comment on this post!